BisketBaskets.com is rooted in Parker, CO, a town we feel is one of the most beautiful towns in the United States. If you�ve been to Colorado, you�ll most likely agree it is an absolutely breathtaking state. From high peaks to relaxing fields, Colorado has the perfect balance of tranquil scenery and hustle and bustle to delight every visitor, and in many cases, transform visitors into residents! Our Colorado gift baskets set us apart from other gift basket companies. We know Colorado, and we capture the exact essence of Colorado in our gourmet gift baskets. Both the packaging and delicious contents of our Colorado gift baskets reflect the fun, adventurous Colorado spirit! Have a Colorado hotel or bed and breakfast? Welcome and impress your guests with a Colorado gift basket in their room upon arrival! 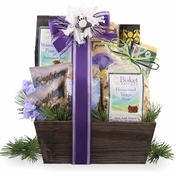 We have gift baskets for every budget, so you�re sure to find the right one for you. These days, it�s important to impress hotel guests so they remember you for their next trip, recommend your hotel on online review sites, and tell their friends about you. Investing in a Colorado gift basket really leaves a lasting impression on your guests and shows you went above and beyond. Check out all of our Colorado gift baskets, and contact us for quantity pricing! As one of the premier vacation spots in the United States, Colorado is where the splendor of nature meets serenity, adventure, and excitement. The perfect setting for your getaway or business event, Colorado offers a wide array of activities, sights, and experiences to delight the senses. Whether you need one or 1,000 Colorado gift basket gifts, we can handle your order. Hand delivery can be arranged to any hotel in the Denver Colorado Metro Area or Colorado Springs. In addition, BisketBaskets.com can ship to any hotel outside that area. Filled with fresh gourmet foods and Colorado treasures, each gift basket is the perfect compliment to your vacation or business conference. Start off your Colorado experience with beautiful Colorado Gift Baskets from BisketBaskets.com.